Sedum telephium ssp. ruprechtii 'Hab Gray'. 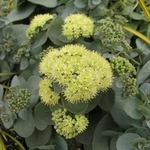 A seldom seen sedum that emerges as a short compact clump that develops long arching stems of glaucous grey-green, slightly serrated leaves. Clusters of creamy yellow flowers open up at the ends of the stems in early autumn. Rabbit-resistant.